"Canadiens" redirects here. For the hockey team, see Montreal Canadiens. For other uses, see Canadien (disambiguation). For other uses, see French Canadian (disambiguation). 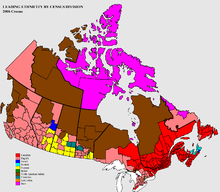 ^ "2011 National Household Survey: Data tables: Ethnic origin". Statistics Canada. March 4, 2014. Retrieved August 17, 2015. ^ Bédard, Guy (2001). 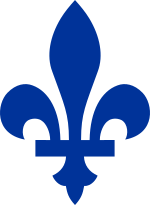 "Québécitude: An Ambiguous Identity". In Adrienne Shadd; Carl E. James. Talking about Identity: Encounters in Race, Ethnicity and Language. Toronto: Between the Lines. pp. 28–32. ISBN 1-896357-36-9. Brault, Gerard J. (March 15, 1986). The French-Canadian Heritage in New England. University Press of New England. ISBN 0-87451-359-6312 pages. 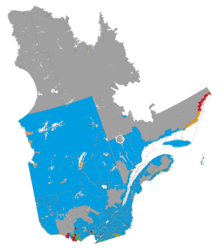 Wikimedia Commons has media related to French Canadians. Look up French Canadian in Wiktionary, the free dictionary.